Magnesium in general is vital in humans since it is involved in different functions such as protein production, synthesis of DNA and carbohydrate metabolism. Despite its importance, over 60% of American adults consume less than the recommended daily intake for magnesium and so a large part of the population has magnesium deficiency. The dietary guidelines for magnesium intake for men is around 310-420mg per day. In the UK and Australia the recommended dietary intake for magnesium for men is 320mg per day and for women it is 270mg per day, however, as people age, generally they require more magnesium. It is difficult to diagnose magnesium deficiency through medical tests since less than 1% of magnesium is in the blood: 99% of magnesium is in the bone, tissues and organs. Many studies have supplemented people with different levels of magnesium to improve patients with different conditions. For example, a study of daily supplementation with 500mg of magnesium for 12 weeks showed that magnesium is an effective therapy for migraine headaches. A recent analysis of more than one million people in nine countries showed that dietary magnesium leads to vast health improvments. The data suggests that a diet rich in magnesium can lower the risk of type-2 diabetes by 26%, heart disease by 10% and stroke by 12%. 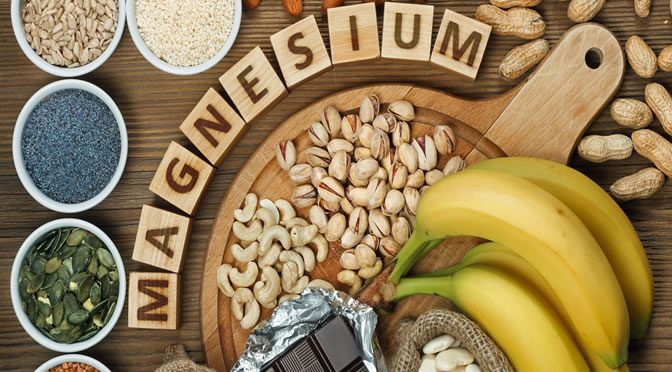 “Low levels of magnesium in the body have been associated with a range of diseases but no conclusive evidence has been put forward on the link between dietary magnesium and health risks. The main source for magnesium is the diet and it is found in foods such as green leafy vegetables, whole grains, nuts and cocoa. Previous PostThe Cooking Water From Sweet Potatoes Helps Weight LossNext PostThe Biggest Myth About Tasty Foods — Debunked!